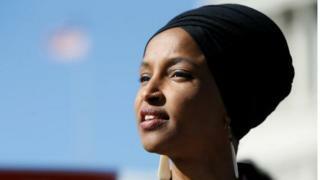 Ilhan Omar last November became one of two Muslim women elected to the US Congress. Hers is a remarkable story. Escaping the protracted civil war in Somalia, she and her family fled and spent four years in a refugee camp in Kenya. She came to America, and now represents Minnesota's fifth district. It is the classic immigrant success story. But now in Congress she finds herself a punchbag. She is outspoken, hostile to Israel, on the left of the Democratic Party - and then came her comments on 9/11. During a speech to the Council on American Islamic-Relations (Cair) she said "some people did something", referring to the attacks. The outrage was swift, the condemnation deafening. Detractors pointed out those four words missed out a few crucial details: some people (Islamist terrorists) did something (flew planes into buildings killing thousands of innocent people). Allies say her comments were taken out of context. But politics is a brutal contact sport - and you need to think about context before you say things like that. It lit up social media, and Donald Trump has done nothing to tamp things down. A video, intercut with her words and planes hitting the Twin Towers in New York, was so disturbing that even the supportive Fox News network would only play a few seconds of it. She is taking one helluva kicking. But this is brutality with a purpose for Republican strategists. In his State of the Union address the president said he would save America from socialism. As radical, progressive Democrats become ever more vocal - whether on the environment, Israel, raising taxes, pushing socialised medicine - so the president sees this as a way of peeling away moderate Democrats and independents. The political centre of gravity in the US is way to the right of what it is in Europe. But the president has also got his shovel out and dug a deep hole, covered it with some brush and leaves, and is lying in wait for the Democratic Party leadership to fall into the trap he's set. Are they going to ally themselves with the young Minnesota congresswoman, in which case he will hang those four words around their necks too, or will they abandon her - allowing the president to proclaim how divided the Democratic Party is? But the Speaker of the House, Nancy Pelosi is a wily operator, and she doesn't blunder into much blindly - as much though Donald Trump wants her to. Ilhan Omar: Who is Minnesota's Somalia-born congresswoman?